Download this white paper for an analysis of the types of data disrupting the workforce and how your organization can improve process and workflows. With emerging technologies like wearables, virtual reality and mobile payment platforms, enterprises are seeing an explosion of new sources of data. 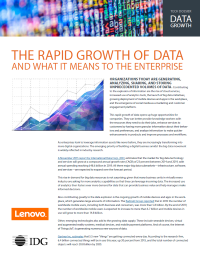 This rapid growth of data opens up huge opportunities for companies.